Team Trucks: Monster Patrol, Carolina Crusher, Boogey Van, Extreme Overkill, Wild Thang, Rampage, Taurus. 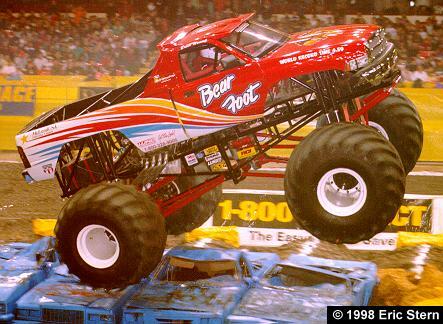 Racing Background: Bearfoot was sold to Paul Shafer in October of 1997. Truck Facts: 2001 Dodge Ram. 572ci Chrysler Hemi with 1500hp. 3 speed Lenco transmission, ZF axles, 66x43x25 Goodyear custom cut tires. 3 months build time at over $ 125,000.00 total cost.